Long ago, before the Haight became hippie heaven, even before Los Angeles became Tinseltown, Americans already regarded California as a strange and wonderful place. "Have you seen the elephant?" was the watchword of the mid-nineteenth century, meaning, "Have you been out to the West Coast?" Those on the Atlantic side of the continent weren’t so naïve as to believe that elephants really roamed the Sierra. The phrase, a slang version of "Now I’ve seen everything," first found tongue in Philadelphia several years before the Gold Rush when patrons attended an unusually imaginative theatrical performance. According to the Washington National Intelligencer, a couple of "b’hoys" were assigned the dual role of a elephant, front and back. Because the beast was there mainly for local color, they didn’t have much to do and soon grew bored. 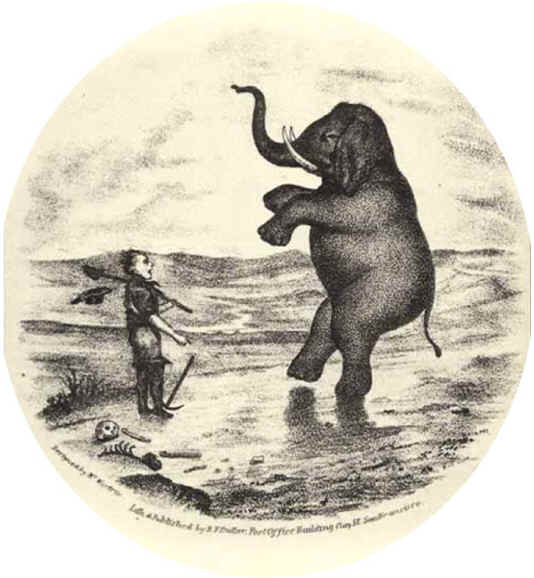 One night one of them, who played the forelegs, devised a diversion: before he came onstage, he refilled the porter bottles that served — bottoms facing out — as the elephant’s eyes, replaced the corks, and sauntered onto the stage equipped with his own private bar. The newspaper account doesn’t say what the hindmost actor was doing at the time; perhaps his partner brought along a cup to share the liquid wealth. In any case, by the time the exit music began, the elephant had lost his footing. He managed to tip himself and the princely hero of the play off the stage and into the orchestra pit, where they landed on top of the conductor and his violin. Poor forelegs, groggily realizing what he’d done, ran from the theater. The conductor followed, brandishing his smashed instrument in menacing gestures of retribution. The actors and audience pursued them into the night, howling with laughter and shrieking at passersby, "Have you seen the elephant?" That’s the story. But you may recall another one, equally applicable to the remarkable qualities that travelers found and continue to find in California: the tale of the blind men and the elephant. When asked to describe the beast, the one who felt the tail said it was like a rope; the one who felt a foot said it was like a tree trunk; and so on. In the same way, the Cali-fornia that a visitor sees in the Mojave bears no relation to the state envisioned by a visitor to Big Sur. In fact, two visitors to the city of San Francisco — in 1849 or today — would most likely come away with very different impressions. Take the seaman who recently spent one night here and visited one bar: Spec’s. Or a skateboarder in town for this August’s X Games. Or the Filipina who just flew in for her niece’s wedding. Are you beginning to get the picture? It’s a pretty complex one and, like the pickled Philadelphia pachyderm, it won’t hold still. All this babble about elephants has a political point, and it’s this: the city of San Francisco is heading toward district elections of supervisors this fall, an experience that is bound to change the way people see the city. If you think that chaos forms the general climate of these here parts, you ain’t seen nuthin’ yet. The numbers themselves boggle minds. As of last week, 122 men and women had announced their intention to run for supervisor, to fill 11 seats. District 2 promises a fairly sedate race between incumbent Gavin Newsom and two opponents. But District 6, which is home to no incumbent at present, is fielding at least 31 candidates. Some, like John Sellick and Joan Roughgarden, are political neophytes. Some, like Carol Ruth Silver and Beryl Magilavy, are already familiar with the corridors of City Hall. Many, like Garrett Jenkins of the North of Market Planning Coalition and Chris Daly of Mission Agenda, have long been active in the substratum of neighborhood politics. The diversity of the districts boggles as well. In a city of neighborhoods, local pride can easily prevail over geographical demarcations. How, for example, will District 2 find a defining issue that will equally involve residents of Seacliff/Presidio Heights, Laurel Heights/USF, Pacific Heights, Cow Hollow, the Marina, and Russian Hill? Even more daunting, how will any of the 31 candidates in District 6 unify the residents of Hayes Valley/Lower Polk, the Inner Mission, South of Market, the Tenderloin, South Beach/Mission Bay, and Treasure Island? The same disparities rule each of the other nine districts as well. After the election, when the district supervisors take their seats in the legislative chambers, what kind of elephant will they bring with them? What kind of alliances will these cobbled-together districts have to create in order to actually accomplish anything? A look to the past may be instructive. Once before, in 1977, San Francisco embarked on the experiment of district elections. Lacking today’s provision for a run-off, some candidates were elected with a very small percentage of the vote in their district: conservative Lee Dolson, from the 9th, snuck in with just 29.4 percent. But even so, the winners formed a pretty representative cross-section of the city. And they were a pretty illustrious lot, whose names still ring a variety of bells: Gordon Lau from the 1st; Dianne Feinstein from the 2nd; John Molinari from the 3rd; Ella Hill Hutch from the 4th; Harvey Milk from the 5th; Carol Ruth Silver from the 6th; Robert Gonzales from the 7th; Dan White from the 8th; Lee Dolson from the 9th; Quentin Kopp from the 10th; and Ron Pelosi from the 11th. They didn’t last long. In 1980, rule from the center returned to the city, and district elections returned to their musty old shelf. Today, as we dust off them off and bring them back into the sunlight, we discover that they’ve changed during their hibernation. Decades of neighborhood activism have honed grass-roots political skills, suggesting that the upstarts may give the candidates anointed by the Democratic Central Committee a good fight. In addition, the city’s population patterns have changed, with a marked tilt toward the east and the south. Tempestuous growth there has spawned neighborhood activism, as well as a sense of unity over similar problems. We’ve already had inklings of confrontations to come, as careful-growth proponents of Daughter of Proposition M with roots in the Mission, SOMA, Bayview-Hunters Point, and Potrero Hill find themselves threatened with partition by Our Mayor’s new slow-growth plan for the Mission. Anything can happen. Only one thing is certain: a brand-new elephant is going to emerge. It may have one leg longer than the others; its trunk may be misshapen; its ears may be bright pink. But it, like all its predecessors, will be something to see.